Once you reach a point where you can make an honest analysis of your work then set a baseline for yourself. Take your best image (you can use more than one), and set it as the wallpaper on your computer (phone, PDA, etc.) and when you see it take the time to pick it apart. Look for ways that you could make it better, and then try to apply those changes to all of your future images (if possible). The goal isn't to re-shoot the exact same scene, but to find and fix mistakes that you might be repeating. Once you take a better photo then set it as your wallpaper and start the process over again. The image included with this post is my current baseline. It's sure to change, but I may not come back and update this post. 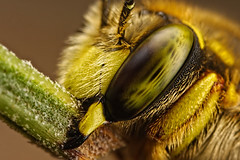 I recently finished my first book, Extreme Macro -the Art of Patience, and it's a coffee table book with some of my best images from 2009 as well as tips on how to shoot insects at high magnification. Writing a book is something that I've wanted to do for a while, and I plan on getting into a regular schedule of photography through the year with a new book in the winter. I have a few ideas for the next one, but haven't settled on a single theme yet. If there is anything you'd like to see in the 2010 / 2011 edition then please let me know in the comments. 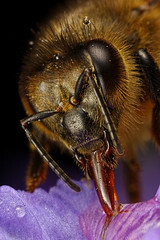 I've been selected by Digital Photographer Magazine as their Macro Photographer of the Year for 2009. I could only enter one image for the contest, the feeding bee that I've included with this post. Considering the level of the photographers that entered the competition, and that have galleries on the Digital Photographer web site, I'm honored to have won!